Born in North York in 1944, Carol and her husband moved to this area in 1974, raising their children Suzanne and Todd on the family horse farm, Gaelic Glen, in Oxford Mills. As a life long horse lover, Carol, along with her daughter Suzanne, started a horse show in 1997 on the farm. This annual hunter/jumper show is part of the successful Silver and Bronze circuit in the Ottawa Valley. This competition, which is now carried on by Carol’s daughter, started as a one day event and has grown into 2 separate events on multiple weekends, attended by well over 200 horses and riders from novice to accomplished categories.As a teacher in our local schools, Carol also coached many of our area youth in badminton, volleyball and her primary sport, track and field. 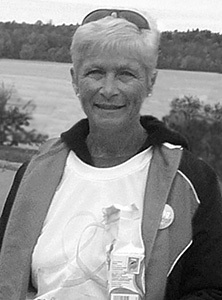 Carol began coaching the North Grenville District High School track team in 1989 and helped to develop many excellent athletes in a very short time. Her commitment to improving the individual was evident from the start, and under her tutelage and training style, the track team became very successful for years to come. She had team members competing and winning at the County level, Eastern Ontario level and the Provincial level, leaving a legacy to be very proud of and difficult to match. When Carol moved from the Junior High to the then new South Branch Elementary School, she enthusiastically jumped in with both feet to help get the new school’s athletic program off the ground, coaching badminton, volleyball and track and field. Again, with her charisma and never quit attitude, Carol developed programs in these sports that serve as models for years to come. Carol was a dedicated, outgoing individual who gave selflessly of her time, funds, mentoring and expertise to develop area youth into the best person, athlete and student that they could be. She stressed fair play and sportsmanship, always proudest when her athletes achieved their personal best whether that meant a medal or not. Carol’s lifelong commitment and dedication to youth and sport in our area serves as a model and inspiration to all of us, not only on the track but also in our lives.